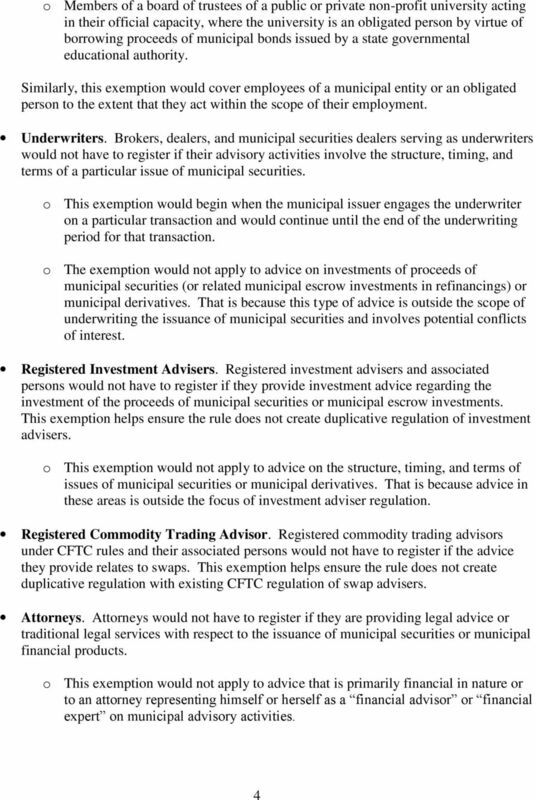 1 FACT SHEET Municipal Advisr Registratin SEC Open Meeting Sept. 18, 2013 The Securities and Exchange Cmmissin tday will cnsider whether t adpt a rule that wuld establish a permanent registratin regime fr municipal advisrs. The Ddd-Frank Wall Street Refrm and Cnsumer Prtectin Act directs the Cmmissin t amend its rules t require this regime. Backgrund Municipal Securities and Municipal Advisrs Every year, states and lcal gvernments issue municipal securities mst ntably municipal bnds t raise funds fr varius public prjects such as building schls, rads, and hspitals. Thse wh purchase municipal bnds usually receive interest payments n the principal amunt they invest and a return f that principal amunt after a perid f time, and the municipalities receive needed capital. Municipalities that issue these securities frequently rely n advisrs, wh help t decide amng ther things hw and when t issue the securities and hw t invest the prceeds frm the sales. In turn, these advisrs receive fees fr the services they prvide. 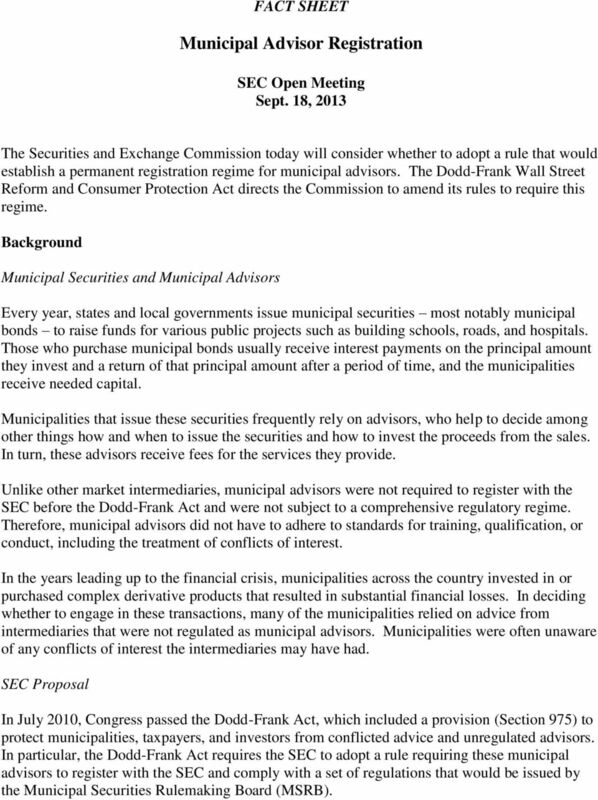 Unlike ther market intermediaries, municipal advisrs were nt required t register with the SEC befre the Ddd-Frank Act and were nt subject t a cmprehensive regulatry regime. Therefre, municipal advisrs did nt have t adhere t standards fr training, qualificatin, r cnduct, including the treatment f cnflicts f interest. In the years leading up t the financial crisis, municipalities acrss the cuntry invested in r purchased cmplex derivative prducts that resulted in substantial financial lsses. In deciding whether t engage in these transactins, many f the municipalities relied n advice frm intermediaries that were nt regulated as municipal advisrs. 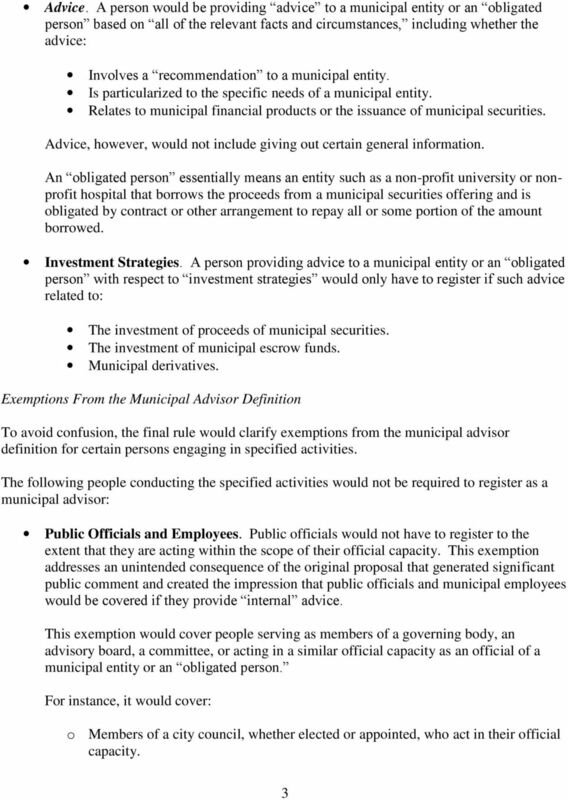 Municipalities were ften unaware f any cnflicts f interest the intermediaries may have had. 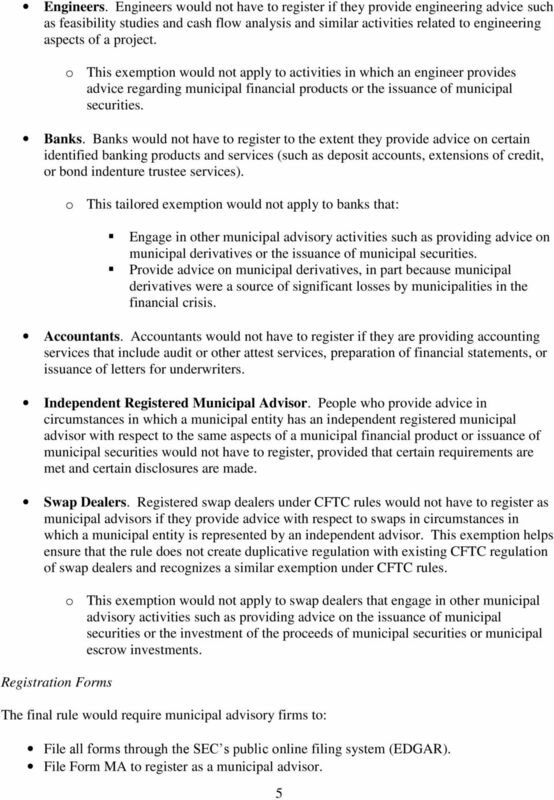 SEC Prpsal In July 2010, Cngress passed the Ddd-Frank Act, which included a prvisin (Sectin 975) t prtect municipalities, taxpayers, and investrs frm cnflicted advice and unregulated advisrs. 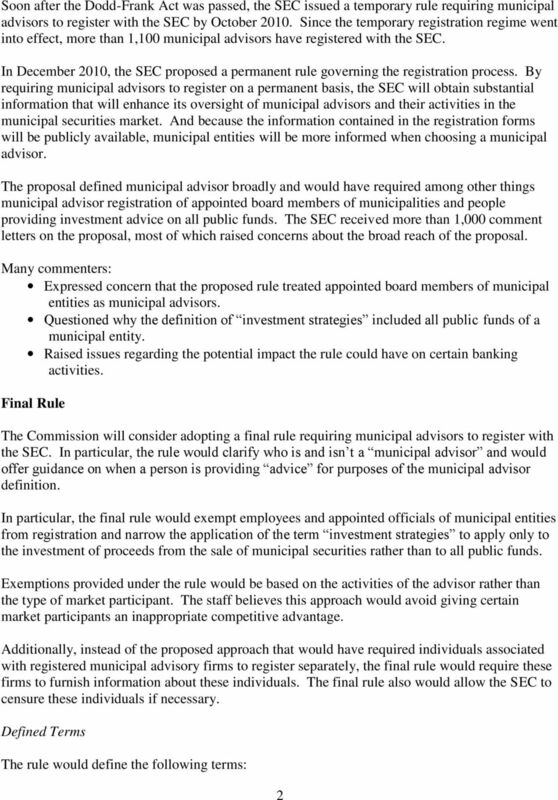 In particular, the Ddd-Frank Act requires the SEC t adpt a rule requiring these municipal advisrs t register with the SEC and cmply with a set f regulatins that wuld be issued by the Municipal Securities Rulemaking Bard (MSRB). SEC FLASH REPORT The Securities and Exchange Cmmissin Issues Prpsal t Strengthen Audits and Reprting f Brker-Dealers t Prtect Custmer Assets and Requests Cmments June 28, 2011 On June 15, 2011, the U.S.
FTE is defined as an employee who is employed on average at least 30 hours of service per week. CHARTER OF THE COMPENSATION COMMITTEE OF THE BOARD OF DIRECTORS OF UPLAND SOFTWARE, INC.
2015 MSBO ANNUAL CONFERENCE. Miller, Canfield, Paddock & Stone, P.L.C. Random IRS Audits: What Do They Look For? March 1, 2012 VIA E-mail t fcs-scf@fin.gc.ca Ms. Leah Andersn Directr, Financial Sectr Divisin Department f Finance L Esplanade Laurier 20 th Flr, East Twer 140 O Cnnr Street Ottawa, ON K1A 0G5 Dear Ms. This regulation is adopted by the director pursuant to the authority in Neb. Rev. Stat. 44-1114. - Upfront fee of $ + GST - Ongoing fee commencing immediately after plan implementation of $20.00 + GST per fortnight. Executive Summary. ERISA allows for the Delegation of Fiduciary Responsibility to independent investment professionals. www.theadvisorlab.com. The information contained in this site is for INFORMATIONAL purposes only and is protected by copyright. We are not providing legal advice. CONTENTS UNDERSTANDING PPACA. Implications of PPACA Relative to Student Athletes. Institution Level Discussion/Decisions. ATTACHMENT 1 CMS Eligibility Requirements Checklist fr MSSP ACO Participatin 1. General Eligibility Requirements ACO participants wrk tgether t manage and crdinate care fr Medicare fee-fr-service beneficiaries. Issue Brief. SBC Distribution Rules for Employer Sponsored Health Plans October 2012. Summary. Which Plans Are Required to Provide the SBC? 4370.4 REV-1. cash flows from operating activities, cash flows from investing activities, and cash flows from financing activities. Overview: August 2012. ABA staff analysis does not provide, nor is it intended to substitute for, professional legal advice. This document provides instructions on how to complete the Cheque Requisition Form. The Advisor Lab, LLC www.theadvisorlab.com Bay Point Financial, LLC www. bayptfin.com. www. bayptfin.com www.theadvisorlab.com. HIPAA Notice of Privacy Practices. Central Ohio Surgical Associates, Inc.